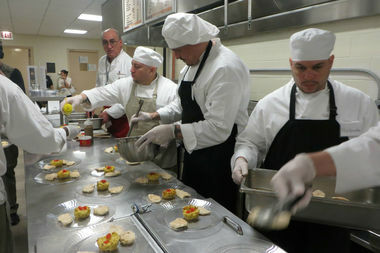 Inmates at Cook County Jail prepare a meal under the direction of chef Bruno Abate (at rear). LITTLE VILLAGE — Recipe For Change, a one-of-a-kind cooking program and nonprofit run out of Cook County Jail, was one of two recipients of a $50,000 MacArthur Foundation Holiday Award, the foundation said Wednesday. Chef Bruno Abate started the cooking program at the jail in 2014 to bring together inmates in the medium-security division of the jail for weekly cooking classes. The goal is to help them develop marketable skills that will land them jobs upon release and keep them out of jail. The other award recipient, the Chicago Pre-College Science and Engineering Program, develops hands-on activities for Chicago Public School students in several city neighborhoods, including North Lawndale, Englewood and Bronzeville. Abate, who owns the Wicker Park restaurant Tocco, works with about 25 inmates at a time, teaching them how to make pasta, pizza and other dishes from scratch. Every month, business leaders, potential donors and other outside guests come to the jail to eat lunch cooked by the inmates. Abate said one of those guests has included someone from the MacArthur Foundation. Foundation employees nominate organizations for the annual award, said spokesman Sean Harder. Last May, Abate had a pizza oven installed in the jail's basement kitchen, where the cooking classes are held. He secured the oven through a combination of private donations and a crowd-funding campaign. Abate said the MacArthur award money will help fund further renovation of the kitchen. He's getting closer to his longer-term goal of bringing food cooked by the inmates to the masses. He said he's waiting on license approval to sell the pizzas his students make in class to the correctional officers and fellow inmates at the jail. Come summer, Abate also plans to have the students harvest and jar eggplant and zucchini from the jail's garden and sell them at the weekly Daley Plaza farmers market.